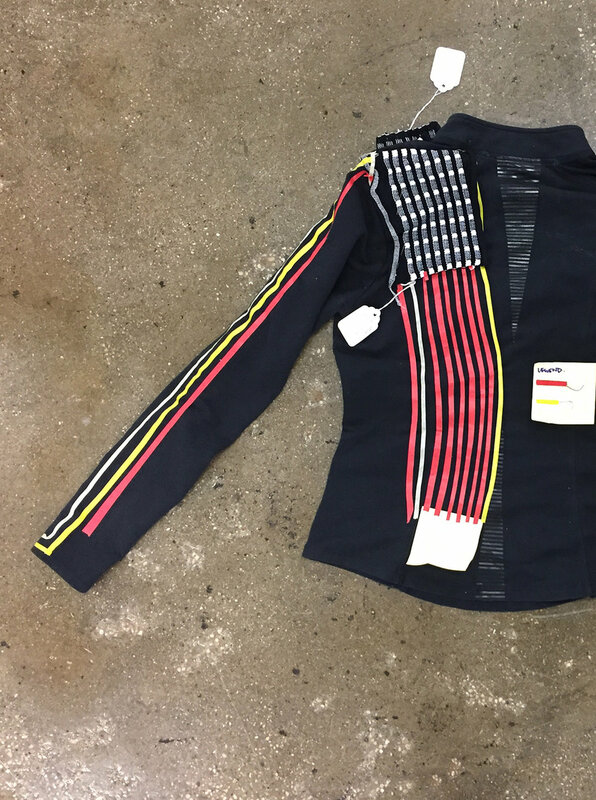 In 2017 Alexia had the chance to participate in the inaugural TEK-TILE fellowship along with 14 other designers and engineers to develop textile swatches with embedded electronics at the Brooklyn Fashion + Design Accelerator. The TEK-TILE fellows where challenged to develop textile swatches and garments embedded with electronics in tandem with the trained professionals at the BF+DA's production lab using their Sheima Seki knitting machines as well as their cut and sew capabilities. 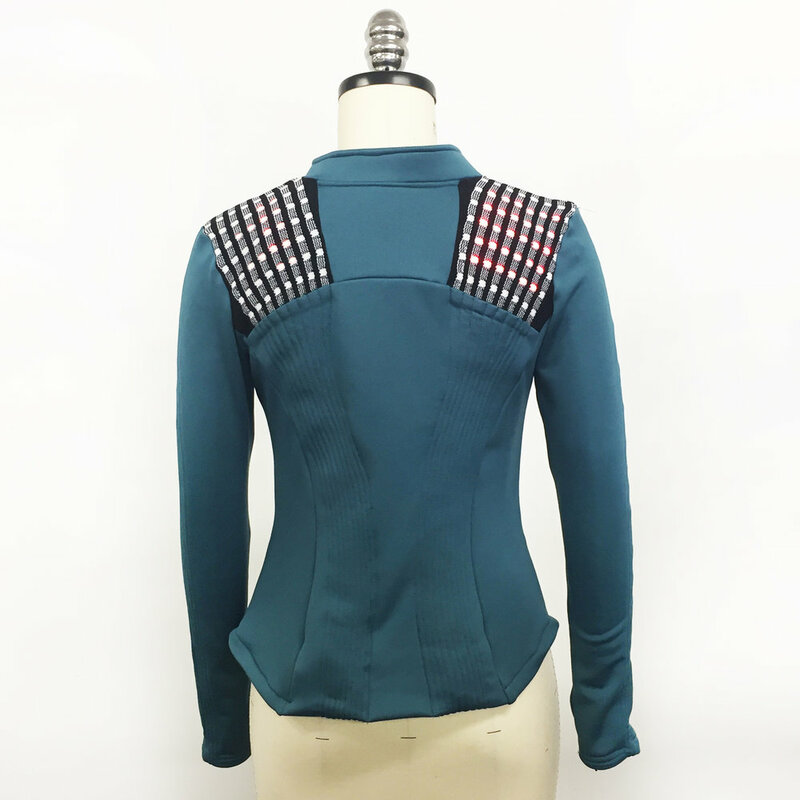 During her time at the fellowship Alexia was involved in ideating and co-developing 3 of the TEK-TILE swatches as well as one of the garments that was produced for the launch of the project: the Signal Cycle Jacket. 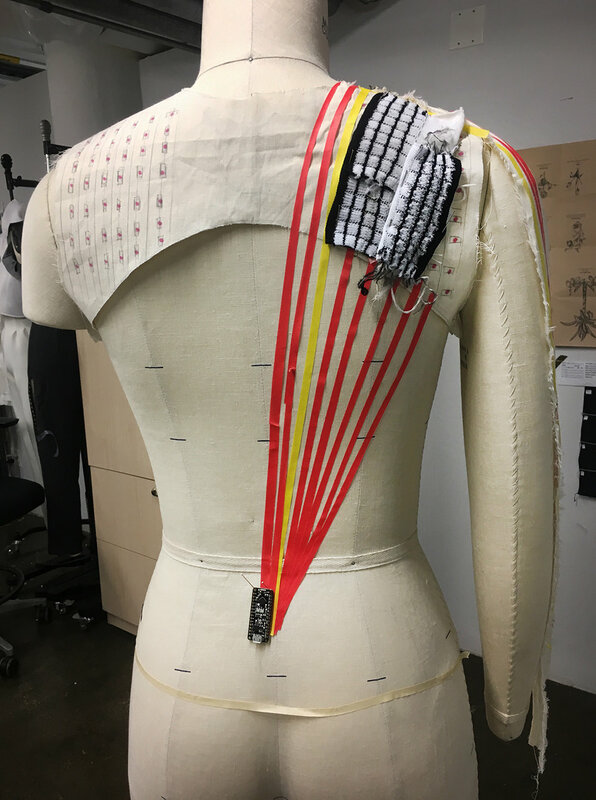 In total the group developed 30 Swatches that members of the BF+DA can now reference if they wish to include this technology in their garments. This piece was developed in conjunction with engineer Zoe Rosenberg, from Lehigh University. Here Zoe and Alexia employed two of the TEK-TILES developed by the group: the LED Pocket Grid (developed by Zoe with the help of the production lab staff) and the Pinch Switch. 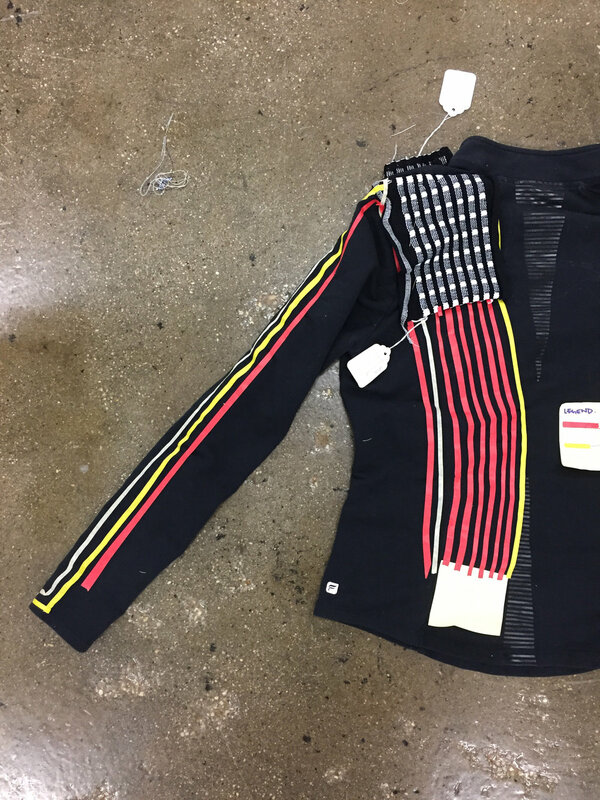 This is how it works: while the rider is cycling the lights are always on, it is not until the cyclist pinches the switch—located by the thumb hole in each sleeve—on the side she/he desires to signal that the LEDs swipe on the shoulder. Here is a peak into the process of laying down the circuit wires to the shoulder pad, as well as the wires to the pinch switches on each sleeve. The Zipometer was one of the basic tiles developed, in it's simplest description it is a zipper that acts as a potentiometer. Think of it as a light dimmer. 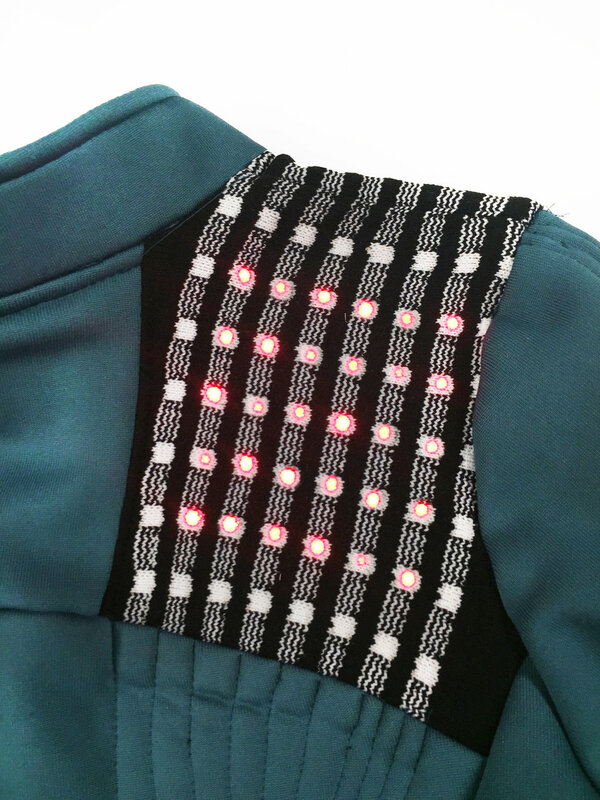 In the case of embedding this into a textile, Zipometer could be used, as in the swatch below, to have a light change colors within the garment, but also has the potential to activate and regulate heating fibers within a garment, or control the volume on your headphones. The final circuit to the LED light was knit into the left panel of the swatch. See process shots below. Alexia developed the visual language and logo for the TEK-TILES, as well as the exhibition headers: a set of enclosures to contain all the electronic elements for each sample and provide exhibition goers basic information about each swatch.